At the launch of a new anti-racism campaign on the transport network, we caught up with workers who described the abuse they’ve received. Sammy Akorede said that dealing with racism is a daily occurrence on Dublin's Luas network. 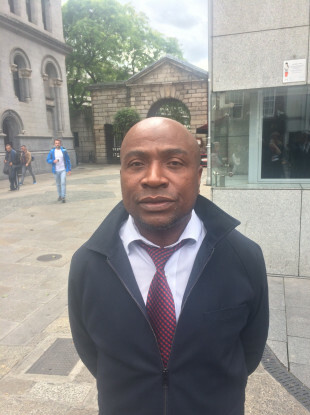 SAMMY AKOREDE IS a revenue protection officer with Transdev, the operator of the Luas. This means part of his role requires checking tickets on trams to make sure people have a valid ticket to travel. He’s lived in Ireland for 17 years, and worked with the Luas for 12. He has been promoted to a manager in his work but still inspects tickets on trams from time to time. On Dublin’s Dame Street yesterday, at the launch of a new anti-racism campaign on public transport, Akorede told TheJournal.ie that racism is a problem that he and colleagues still face regularly. “It affects my colleagues and I greatly to be honest,” he said. “Over the last few years, since the inception of Luas, we’ve encountered racial abuse the likes of which shouldn’t even be mentioned on tv. It’s as bad as it could be… we believe that there is still much to be done to counteract racism in Ireland. We asked Akorede how often he would have to deal with racist abuse. “To be honest,” he said, “every day”. “We operate an open system, which means the tram gets from one point to another. The driver just opens the door. So if someone has abused you, when you reach the next stop they just walk away. [They go] without any consequences. They will definitely be back again and do it. He explained how internal procedures are set in place to record incidences of abuse, including racial abuse, on trams. Sammy said that, in most cases, the gardaí are not called as the abusers are often gone within minutes of an incident occurring. “Cases like abuse, racial abuse – people just walk away,” he said. “They always come back and do it again, which is a problem. We need to have consequences for actions like that. There’s no way to rationalise how you get over it. You just do. It’s an emotional thing. You’re there at work… and you get serious abuse. People throwing bananas at you, telling you to go back to your country just for asking to see a ticket. He said that he has mainly experienced racism in his workplace since he came to Ireland from Nigeria. He did say that experiences of racist behaviour have certainly decreased in recent years, but added that “there’s still a lot of work to be done”. Sydney Mthi is a driver for Dublin Bus. He’s been with the company for the past 12 years. He said that racism is not something that he would experience on a regular basis, “but it does happen, it exists”. “Maybe once in a month you would have an incident,” Mthi said. He said that most of the abuse he receives is verbal. “If you approach someone about not paying a fare, then it can quickly turn into something racial,” he said. “You do get annoyed about it but at the same time there’s not much you can do. Mthi said that it’s something that can be reported, but the abuse he gets is mostly from young people and teenagers. He agreed with Akorede that incidents of racial abuse have gotten less frequent over the years but said that there are still problems, and that he doesn’t encounter racist abuse that often outside of work. Having said that, about two or three months ago, somebody spat at me on D’Olier Street. That was horrible. It stays with you a long time. I’m living in Ireland 17 years and that’s the worst thing that has happened. Mthi added that often regulars on his bus route would speak up to defend him if another passenger has been abusive on the bus. As part of the new anti-racism initiative on our transport network, a huge poster bearing the message “we’re all made of the same stuff… say no to racism” has been placed on Dublin’s Dame Street. The diversity of the transport workforce was also highlighted at the launch of the campaign on the same street in the capital yesterday. Ethnic minorities make up 17% of Dublin Bus’ workforce, for example. Bus Éireann counts staff from 33 different backgrounds among its workers, and 30 different nationalities make up the 264-strong Transdev (Luas operator) workforce. In all, a total of 1,065 posters will be displayed on Ireland’s transport system promoting this anti-racism message over the next few weeks. The campaign is coordinated by the Immigrant Council of Ireland, and is now in its fifth year. Its CEO, Brian Killoran, told TheJournal.ie that 20% of the racist incidents that are reported to the Immigrant Council stem from public transport. “The staff at the companies are much more diverse now than they were 15 years ago,” he said. “Sometimes they are targeted by members of the public, or sometimes it is members of the public on each other. The nature of it varies from verbal things right up the way to assaults. The impact of it is always serious. If somebody is getting racially abused on a weekly basis in various settings, that has a massive impact on someone’s consciousness or just their ability to feel at home. Killoran said that many instances of racial abuse do not get reported but that, through campaigns such as this one, there are often spikes in the number of cases brought to the attention of the Immigrant Council. “People would say frequently to us ‘there’s no racism in Ireland’. We’d say it’s not to the same extent you’d see in other countries,” he said. We don’t have organised racist parties, we don’t have an organised far-right and we don’t have anything like what’s going on internationally at the moment. But that doesn’t mean [racism] is not there. Killoran said integration has happened naturally over the last few decades in many Irish communities, but that “we’re behind the curve” in having policies and diversity strategies in workplaces in this country. Email “'People throw bananas at you or tell you to go back to your country just for asking to see a ticket'”. Feedback on “'People throw bananas at you or tell you to go back to your country just for asking to see a ticket'”.